H22A VTEC engines are fantastic for the tuner market, offering large displacement, fantastic bore stroke combinations and great airflow. They have huge power potential in both N/A and turbo form. The Kelford Range of H22 camshafts feature the same lobe designs as our popular B series cams to cover the needs of most motorsport uses. Custom cams are also available, either ground to your specifications, or designed for your application. 284/280 Degrees advertised duration, 11.80mm /11.30mm lift. 294/286 Degrees advertised duration, 11.80mm /11.30mm lift. 284/274 Degrees advertised duration, 11.25mm /11.00mm lift. 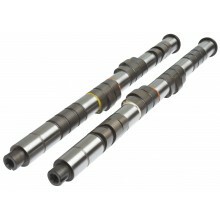 Custom cams for Honda H22A VTEC engines.